The simultaneous search of three residences in Searcy County has led to the arrest of six people and the seizure of narcotics, drug paraphernalia, weapons, money and vehicles. Searcy County Sheriff Kenny Cassell says the arrests on Feb. 4th follow a joint investigation by his department and the 20th Judicial District Drug Task Force. Cassell says 64-year-old Kenneth "Kenny" David Harris of Searcy County has been charged with 10 felony counts of possession of meth or cocaine with intent to deliver; use or possession of paraphernalia to manufacture meth or cocaine; possession of a Schedule I/II controlled substance, not meth or cocaine; and offenses relating to records maintaining a drug premises; as well as two misdemeanor drug-related counts. Harris' bond was set at $90,000. Forty-eight-year-old Marlene Michael of Marshall has been charged with felony counts of possession of drug paraphernalia to ingest, inhale, etc. ; use or possession of paraphernalia to manufacture, etc. meth or cocaine; and possession of firearms by certain persons. Michael's bond was set at $18,000. Also charged was 64-year-old Ronnie Harness of Marshall. Harness faces felony counts of possession of drug paraphernalia to ingest/inhale and theft by receiving a firearm valued at less than $2,500. Harness' bond was set at $7,500. Two people, 62-year-old Donald W. King and 41-year-old Mistie B. Hargrove, both of Marshall, have been charged with felony counts of possession of a Schedule I/II controlled substance, meth or cocaine; and possession of drug paraphernalia to ingest, inhale, etc. ; as well as a misdemeanor drug-related offense. King's and Hargrove's bonds were set at $5,000 each. The sixth person, 40-year-old Shelly A. Kilby of Marshall, has been charged with a felony count of possession of drug paraphernalia to ingest, inhale, etc. Kilby's bond was set at $2,500. 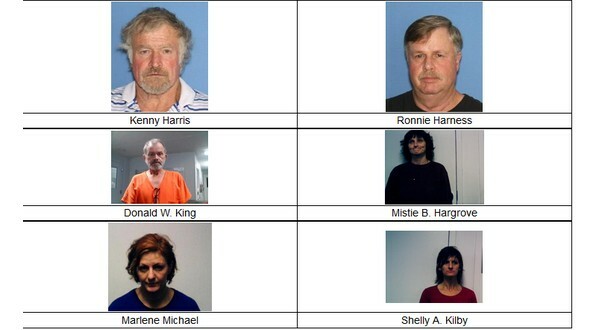 The six are scheduled to appear in Searcy County Circuit Court on Feb. 25th.